Lionel Barrymore. James Stewart. Gloria Grahame. Henry Travers. Donna Reed. Thomas Mitchell. Ward Bond. Frank Faylen. Frank Capra. Classics. Christmas Films. Rob Recommends. Weepie / Tear Jerker. Peoples' Choice. Critics' Top 100. Feel Good. Drama. 1920s. Comedy. Guardian 1000 Must See (2007). AFI Top 100 Movies Ever. Historical. 01 Tara's Midnight Movies. Recommended. 01 Ade tastics. Frank Capra's classic bittersweet drama about George Bailey (James Stewart), a small town businessman who has long considered himself a failure. Things come to a head one Christmas Eve in 1946, when facing financial ruin and arrest he contemplates suicide. Standing on a bridge and ready to jump George's fate now rests in the hands of an Angel eager to earn his wings. 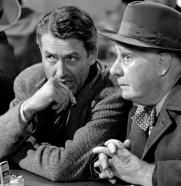 It's a Wonderful Life is widely considered to be one of the finest films ever made, it is certainly one of the greatest feel-good ones..